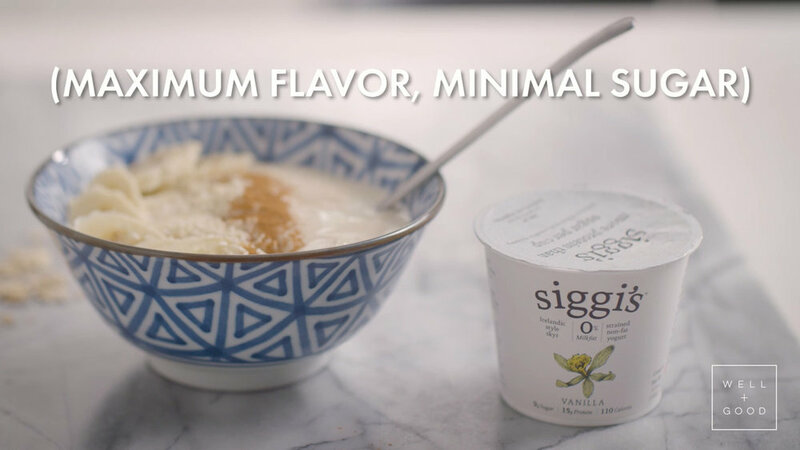 This month I am partnering with Well + Good, and my favorite yogurt brand, Siggi’s for some fun video collaborations. First up one of my go-to weekday breakfasts Tahini Overnight Oats. Making overnight oats the night before ensures that I will have a nutritious breakfast the next day that is already ready to grab and go. Plus its super healthy and filling. Topped with thick and creamy yogurt (for more extra protein!) and this really addicting tahini sauce. Enjoy! 1. In a bowl or mason jar, mix together milk, tahini, vanilla extract, and maple syrup. Add the oats, thoroughly mixing everything together. Cover the bowl with plastic wrap and set in the refrigerator overnight. 2. The next morning, in an additional bowl, stir together tahini, maple syrup, milk, cinnamon and salt, until creamy. 3. Remove overnight oats from the refrigerator, and place in a serving bowl. Top with siggi’s vanilla yogurt and banana slices. Drizzle the creamy tahini over the bowl, and sprinkle with sesame seeds.